Jack Broadhead and Charlie Dawes have been allowed to leave, but new manager Dean Saunders wants to retain Jimmy Ryan, Drew Talbot and Armand Gnanduillet. “They are away at the moment but I plan to speak to them as soon as possible,” said Saunders. Broadhead, who came through the club’s academy, made his debut as a substitute in the FA Cup tie against Hartlepool United in November 2012. His two other first-team appearances came this season, coming on as a substitute in the league game at Port Vale in August and starting in the Johnstone’s Paint Trophy tie at Scunthorpe United the following month. 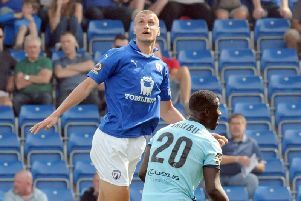 The 20-year-old central defender had spells on loan at several non-league clubs including Buxton and Frickley Athletic. Chesterfield-born Dawes was signed from Sheffield Wednesday last summer. The 19-year-old striker’s solitary appearance came in the Johnstone’s Paint Trophy tie at Scunthorpe in September. He had spells on loan at Matlock Town and Stalybridge Celtic.